Johanna Winters admits she sometimes hides behind the puppets she creates. They express things the soft-spoken woman might not be comfortable publicly sharing. Issues of aging and being told she is obsolete haunt the 35-year-old. When she manipulates a puppet, people are not watching her. They are focused on the movement of the puppet, and that feels safe for her. On a recent afternoon, in her basement office in the printmaking studio of the Lawrence Arts Center, she slipped one of her giant wrinkled papier-mâché creations — complete with a pointy nose, widely spaced eyes and a thatch of blond hair — over her head. Then she placed both hands on her hips and struck a bold pose, becoming another creature altogether. Winters is the 2018-2019 printmaker artist-in-residence for the Arts Center. Since August, she has been teaching printmaking classes, taking part in community outreach projects and delving deeper into puppetry. It was something she began exploring while working on her Master of Fine Arts degree in printmaking at the University of Tennessee in Knoxville. At the Arts Center, she has been turning her drawings into prints that have become puppets. She plans to present them all together in the same space in “Endling,” the title of her solo show opening May 31. While she has created marionettes, she also considers her big papier-mâché heads to be puppets. 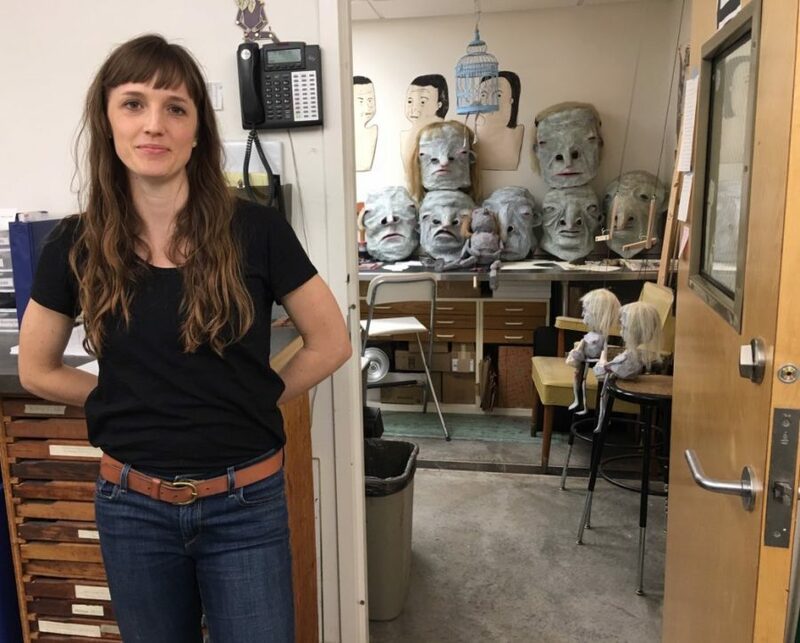 Recently Winters taught a special course in making puppet heads out of papier-mâché for the upcoming production of “The Runaway Orchestra,” opening April 5 at the Arts Center. Winters is one of two current artists-in-residence. Nate Ditzler is participating in the ceramist residency program. Ditzler is teaching classes, doing community outreach and creating new works of art for a solo show this summer. Kyla Strid, the center’s director of residencies and adult education, said the center had close to 90 applicants for the annual residencies this past year. Artists from around the world applied. “It was very competitive,” Strid said. Both artists stood out from the crowd. Click for more including photos!